Charles Alderson (Service No 2955A) was born in Woonona, NSW and was the last of three brothers to enlist. Charles' father was a builder from Ashfield, NSW who had travelled to England for civilian aid to the troops and had been gone for some months when Charles first enlisted at age 16. His correct age was found out and Charles was sent home. As soon as he turned 18 Charles enlisted again, this time using the alias Harold Palser. The enlistment papers for Harold Palser (Service No 2955) state 'Harold' to be single, 22 years of age, and employed as a clerk. 'Harold' embarked on HMAT A11 Ascanius with 7th Reinforcements, 56th Battalion on 25th October 1916 and arrived in England on 28th December 1916. 'Harold' was posted to 20th Battalion and arrived in France with them on 23rd March 1917. 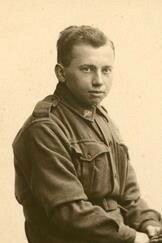 On 3rd May 1917 the 20th Battalion was involved in the battle at Bullecourt and Charles was killed in action. There is no known grave. Charles service is commemorated under his true name on the Australian National Memorial at Villers-Bretonneaux. His NAA file contains a number of letters from his father explaining his story and having his true name recorded. Both Charles' brothers, Henry (Service No 1702) and Frank (Service No 1703) returned to Australia.